A Hood to Coast part 1 recap will be on the blog next week along with how my marathon training is going, but today is all about sweet snacks. 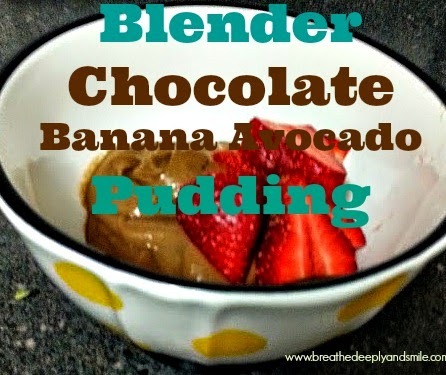 I am always saying how I have a big sweet tooth so I thought I'd share some of those satisfying snacks I'm loving lately. I'm pretty sure I've raved about these bars before, but this flavor is heavenly. 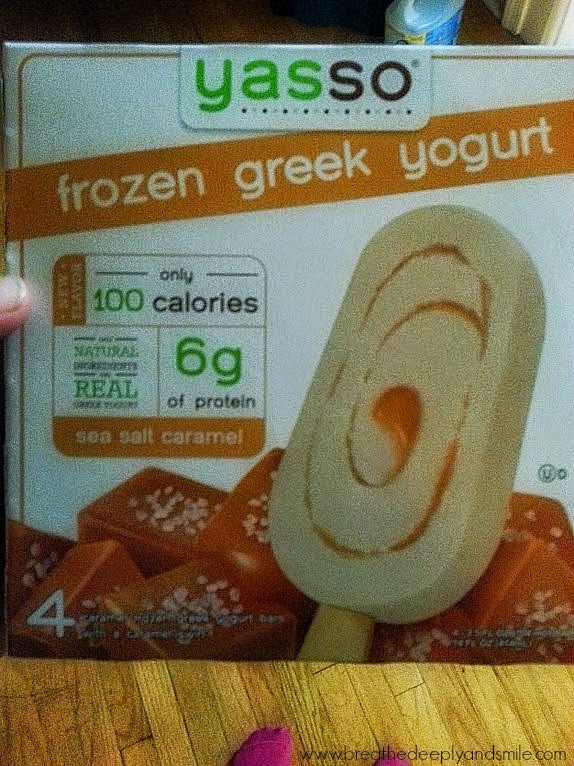 They are made with protein-packed greek yogurt but taste like an actual ice cream bar with delicious caramel swirled in. I don't know how they do it! At 100 calories, it's totally okay if you eat two in one day (been there, done that). 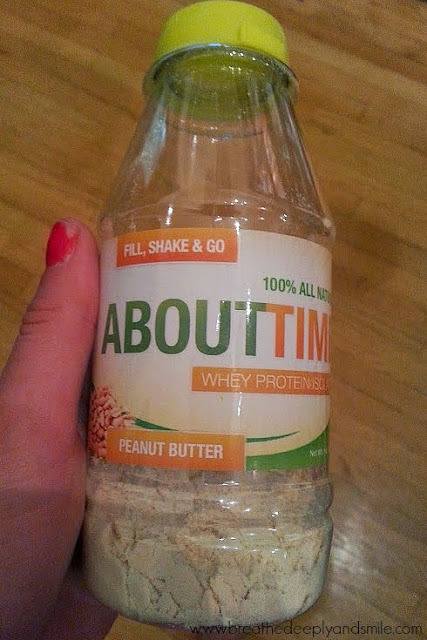 About Time was kind enough to send over a few of their products for me to sample which interested me because About Time protein products are gluten-free, lactose-free, and stevia-sweetened. I'm always skeptical of protein powders because they never taste that great, but this peanut butter flavor tasted awesome with some vanilla almond milk shaken in. I loved having this in my purse as a sweet snack on the go and being able to recycle the bottle and not carry around a shaker afterwards. 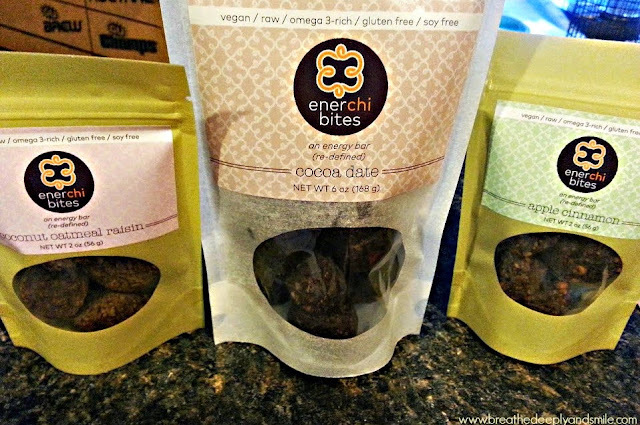 I won some EnerChi bites from someone else's giveaway a couple months ago and recently have been loving them. They are gluten-free, nut-free, soy-free, and all natural snacks with a texture similar to Larabars. 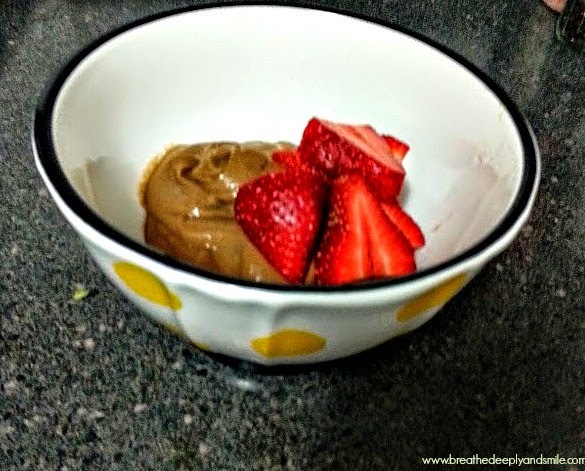 They are the perfect sweet pre-workout or after dinner bite. I was sent Cocoa Date, Coconut Oatmeal Raisin, and Apple Cinnamon bites. I thought the Cocoa Date would be my favorite but lately I'm digging the apple cinnamon which taste like little pie bites. EnerChi bites have a great kickstarter campaign running right now so if you're interested in them, check it out! I found a ridiculous sale (3 packs for $5!) on strawberries at the grocery store this week so I have been eating them everyday. I love summer berries and will have my fill before it gets cold again for sure. A favorite dessert this week has been sliced strawberries topped with whipped cream. I found TruWhip at the store which is non-GMO, gluten-free, and made with all natural sweeteners and no processed crap. The other night I got fancy and drizzled a chocolate shell on top. I made the chocolate shell by simply mixing 2 tablespoons of liquid coconut oil (my jar is liquid due to the heat but if not, microwave for 20 seconds) and 2-3 teaspoons of cacao powder (cocoa powder works fine), and a few drops of liquid stevia (you could use any sweetener you'd like!). I mixed everything together in a bowl, drizzled on my strawberries, and popped in the freezer for 10 seconds. If any of my Hood to Coast teammates read this, they will definitely agree about this snack. In our vans' snack boxes there was a big bag of peanut butter filled pretzels from Costco. Let's just say I'm pretty sure our bag was empty by the time the trip ended. I love the combination of sweet peanut butter and the salty pretzel, and they made great fuel for running!I don't know if I can buy these similar ones from Trader Joe's without finishing the bag in 2 days. I had tweeted my photo of my chocolate pudding I whipped up in my NutriNinja yesterday and Ninja Kitchen decided it would be a great Labor Day treat so I'm putting it up on the blog! Last night I literally just wanted something post-dinner to satisfy my sweet tooth so I did a take on my chocolate avocado mousse. 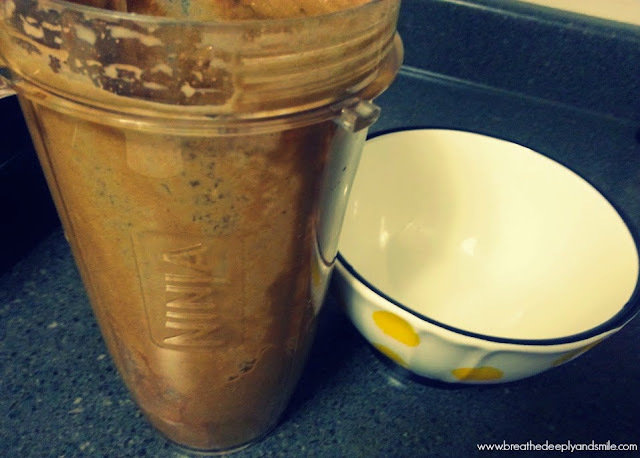 Everything was just thrown in my NutriNinja and blended within seconds! 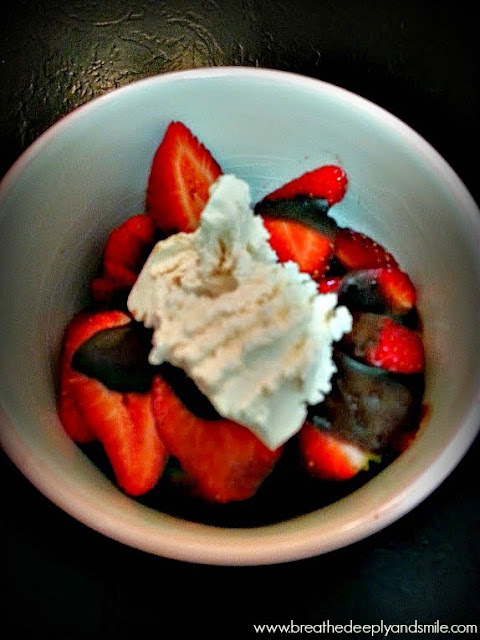 Of course I topped it with more fresh strawberries because chocolate and strawberries are quite the pair. What are your favorite sweet snacks lately? What do you like to eat strawberries with? 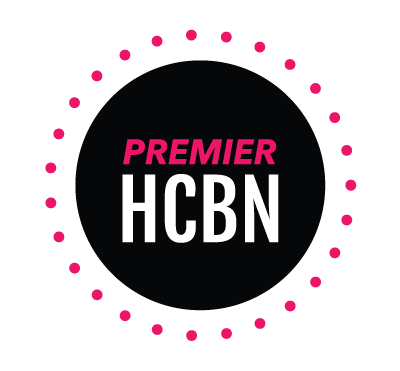 This post was shared in the the Health & Fitness Tip link-up..
Disclaimer: I was given a set of About Time products and a NutriNinja blender to review on my blog. I received no other compensation for this post. All other items unless otherwise mentioned were purchased with my own money. All thoughts and opinions are my own, as always. Cheribundi 7-Day Challenge: Recovery With Cherries! I'll just say that Hood to Coast was amazing so don't worry, you'll be hearing plenty more about it! 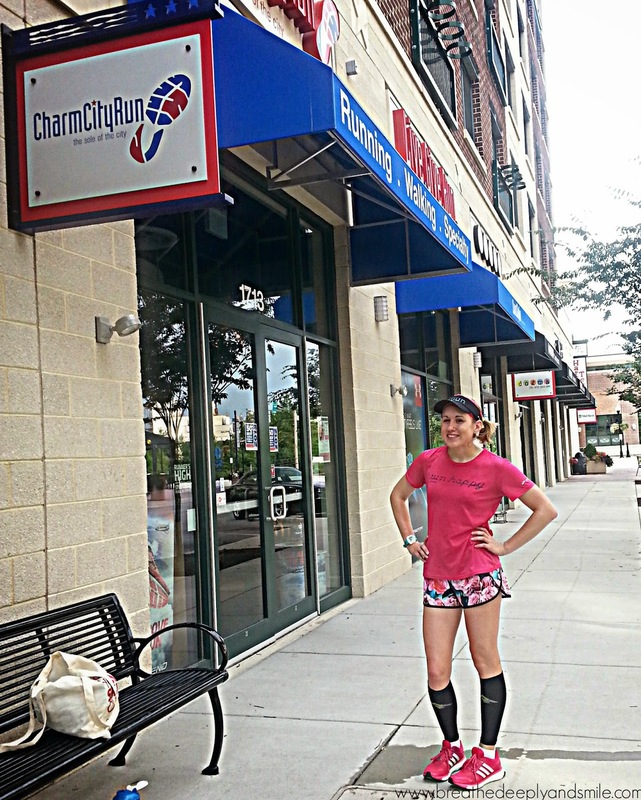 While I clearly love things like compression socks, I'm always looking for new ways to help speed recovery and reduce soreness especially during a big training cycle like marathon training. That's why I was really excited to learn that sour cherries could help with recovery. I really like cherries, especially in pie, so I knew you wouldn't have to twist my arm to get me to drink some cherry juice! 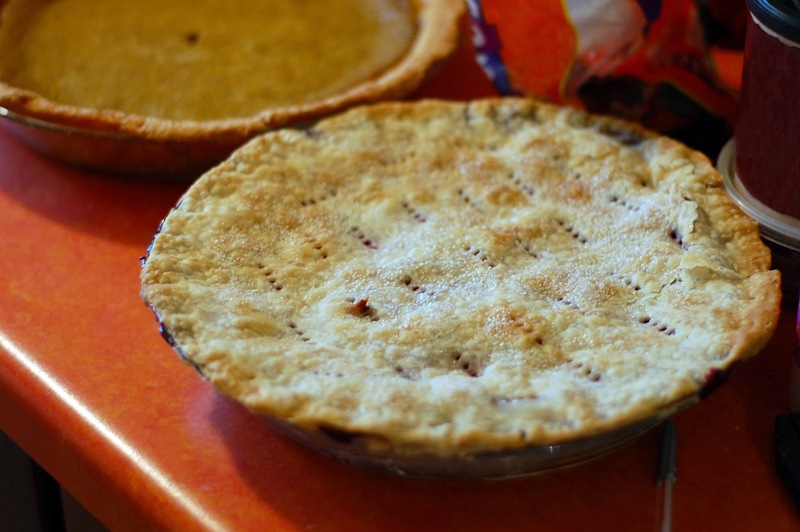 Cherry pie is always yummy. Sour or tart cherries are not only delicious, but also happen to be superfruits loaded with nutrients. I learned that they are tart and red because of the amount of anthocyanins inside. The chemistry nerd I am loves learning all the real science behind things like food. Anthocyanins are also responsible for health-promoting properties such as reducing muscle soreness, easing arthritis pain, and promoting heart health. Cherries also may help in improving sleep due to the melatonin they contain. So sour cherries are pretty much awesome-plus they are loaded with antioxidants! Disclosure I was given a set of juice and Cheribundi coupons for the duration of the challenge along with two free cases of Cheribundi juice to review on my blog. I received no other compensation for this post. All thoughts and opinions are my own, as always. The time has come for HOOD TO COAST! Of course I packed last minute and was trying to fit everything into two little bags. 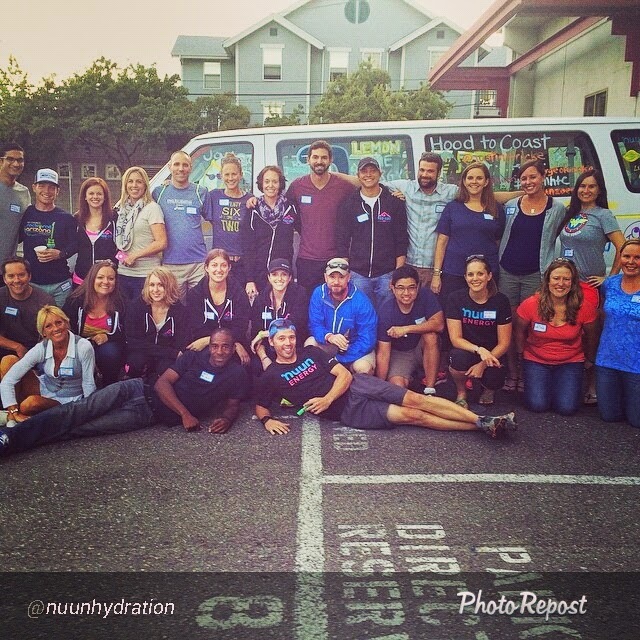 Nuun Hydration teams wild berry energy and lemon-lime energy the night before the race! 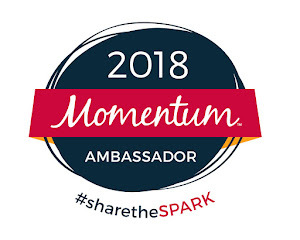 Disclosure: Through a partnership with Fit Approach as a Sweat Pink Ambassador and Pro Compression, I received a complimentary pair of black marathon calf sleeves .All other Pro Compression gear mentioned and pictured was purchased previously by me. As always, all thoughts and opinions are my own. 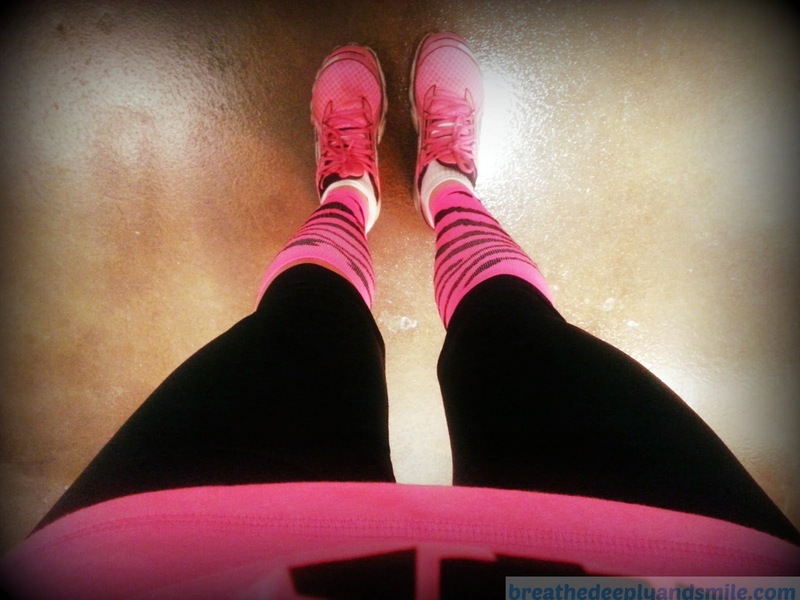 I've become a huge fan of compression gear for recovery and have been using it ever since I trained for my first half marathon. I usually wear the socks or sleeves for long runs, races, and post-run recovery. After trying a few different styles, the ones I wear the most are Pro Compression, so I was excited to officially review a pair of their Marathon Calf Sleeves. Pro Compression sells calf sleeves, over the calf compression socks, mid socks, low socks, and other active wear. The true graduated compression in Pro Compression products promotes circulation from your feet and ankles toward your knees while also reducing inflammation and providing stability to muscles and tendons. The bottom of the sock is tighter than the top to promote this flow. Lots of randomness in my brain today so I was happy to link up for Thinking Out Loud Thursdays. 1. HOLY MOLY. Hood to Coast is less than a week away now. I'm not packed, literally ordered my headlamp off Amazon yesterday, and am not feeling ready to run almost 16 miles in 24 hours. Also it's been a few years since I've been on such a long flight, and I've never travelled so far completely alone. 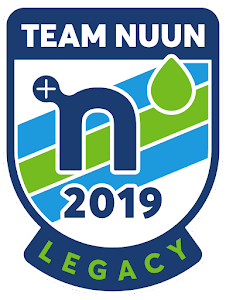 However, I'm beyond excited to make a bunch of Nuun friends and see the Pacific Northwest. I also flipped out when I read on the itinerary we'd be touring the new Brooks Headquarters in Seattle! Crossing my fingers for some free shoes...or a job offer-one can dream! And yes I'm still holding out that Kara Goucher drops by. 2. My quads are SO sore today from the November Project workout yesterday. I don't know why but lunges always kill my legs. I didn't foamroll last night either, whoops. Teams of 4 split a ladder workout of 500 mountain climbers, 400 squats. 300 lunges, 200 push ups, 150 burpees, and 100 box jumps plus running stairs in between each one. My team only made it past the push ups, but don't worry, it was still a killer workout! 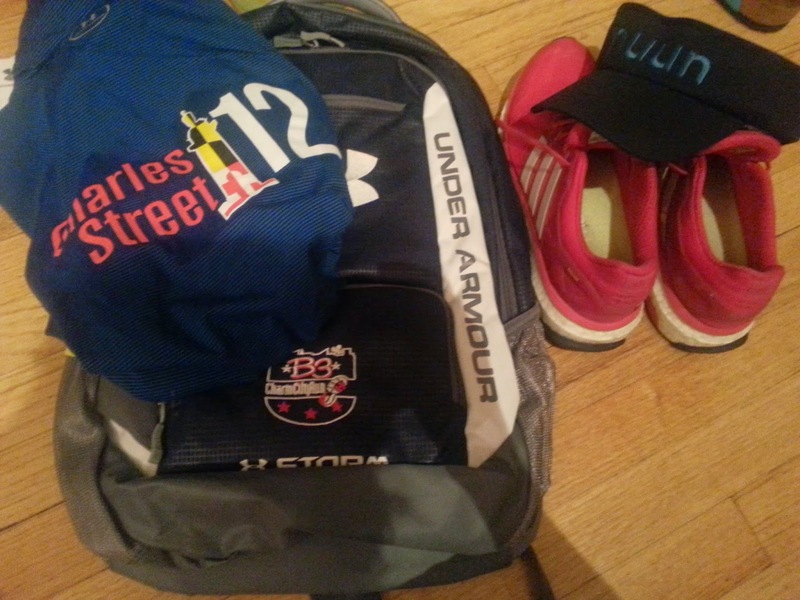 For the Charles Street 12 Miler this past weekend, I went in a bit unfazed. 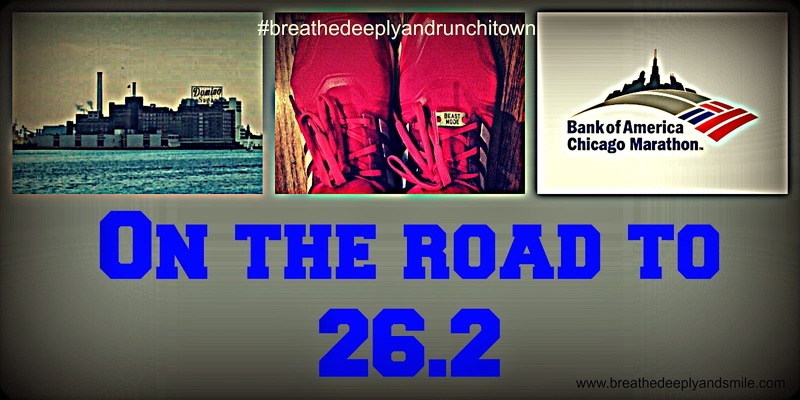 I am in the thick of marathon training and would have been running a similar mileage anyways. However, I was happy to be running in a race setting as a nice change of pace. I LOVE the blue Under Armour half zip premium this year and even got an extra goodie-a sweet UA backpack for completing the Charm City Run B3 race series. I didn't sleep well the night before and had to get up even earlier to get in an extra 4 slow miles to make the total for the day 16 miles, since I skipped my long run last week. Sarah was meeting me at my apartment so my wonderful boyfriend could wake up to take us to the 7:30 AM start in Towson. 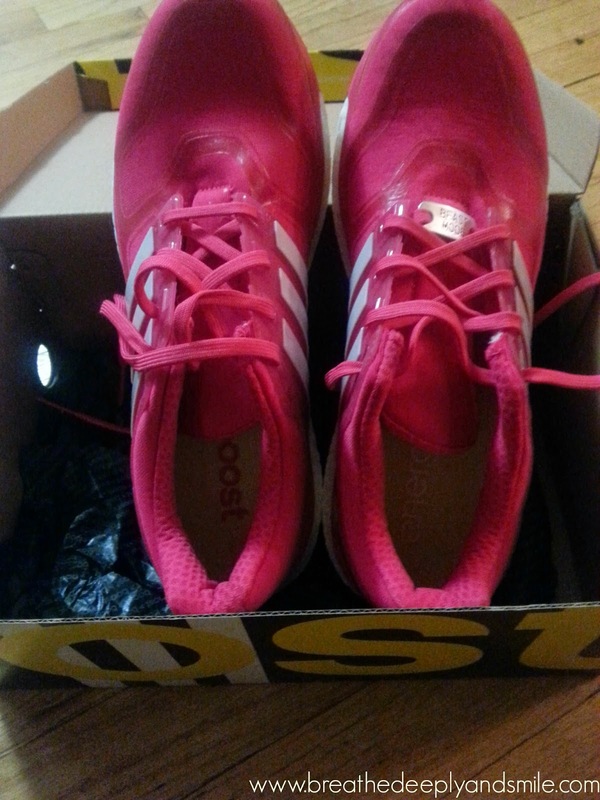 I had been in a rush to just barely get in my 4 extra miles before we left for the race so I didn't grab everything I wanted or do things like double knot my shoelaces (which I found out at mile 3). I'm so not a morning person. Hello, August-why are you here so fast?! My summer seems especially busy this year and is flying by. Not cool. A busy schedule is hard to balance with marathon training which can be seen with my solid week 6 and pretty much non-existent week 7 of training. Long run: Week 6 had a long run of 12 miles, and week 7 was supposed to be 15-17 miles. Week 6 felt great. 12 miles with friends went well with a nice route along the harbor. I took a salted caramel Gu after mile 6 to stick with my marathon fueling plan, but I never felt super sluggish during the run. 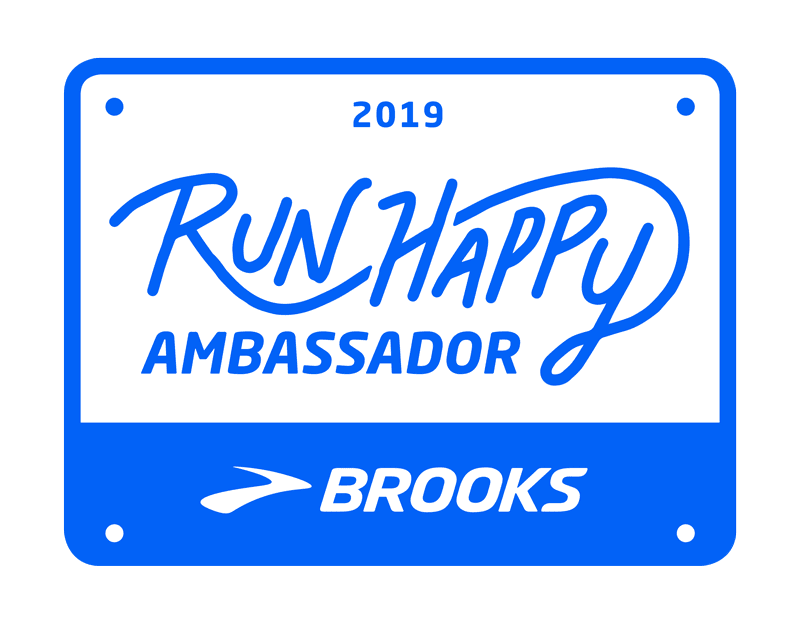 I was wearing some of my favorite running clothes including my Lululemon speed shorts and Brooks "Run Happy" shirt. The weather was really mild with this strange unseasonable cool weather we have had the past couple of weeks in the Northeast. I love Charm City Run!